This summer, the History Department has numerous interesting courses available for student registration. Still looking to fill your schedule? We’ve got you covered. This online course will be taught by Dr. Luis Martinez-Fernandez. 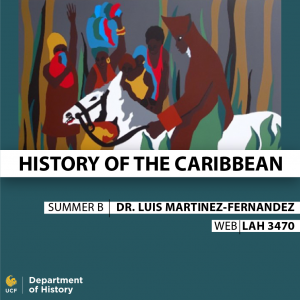 History of the Caribbean provides student with a multidisciplinary introduction to the historical trajectory of the Caribbean from the pre-Columbian era to the present. It covers selected topics such as Amerindian societies, European colonization, slavery and plantation systems, the struggles for freedom and nationhood and more contemporary topics such as U.S. expansionism, dictatorship, revolution and challenges to socio-economic development. 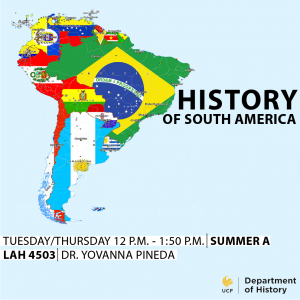 Dr. Yovanna Pineda will teaching History of South America during Summer A, Tuesday/Thursday 12p.m. to 1:30p.m. History of South America introduces students to the great demographic, cultural, social and environmental diversity of South America during the nineteenth and twentieth centuries. You’ll gain a deeper understanding of South America through lectures, discussions, role immersions, debates, films and traditional readings. For more information on courses being offered for the Fall of 2018, stay tuned to the website.